Here's the thing about farm life. There's always something that needs to be fixed. Or more like 20 somethings. Unfinished projects abound and there's never enough time in the day to get to them all. I guess that over the years Paul and I have learned to roll with the punches. I mean isn't it normal for your lawnmower to be held together with duct tape, and a mouse to build a nest in the door of one of your cars? Or maybe it was because of that time we spent three months without running water (yes, I do need to blog about that at some point) - that definitely toughened us up. Or perhaps we learned our survival skills from the process of building a house together. We all know house building is just a recipe for mayhem. One way or another, in 14+ years of marriage we don't flip over the little stuff so much anymore. Because there is just so much little stuff that you'd drive yourself crazy if you worried about it all. A busted pipe, one that we no longer use. This used to bring water into the trailer, back in our single-wide days (yet another survival story). It froze and busted, then ran until our well went dry. I shut off the water system and my dear neighbor JP brought me enough jugs of water to get through the day until Paul came home with the part to fix it. Well, I'd already forgotten the water situation the next day, when I went to meet Paul for lunch while my mom watched the boys. We were driving by the mall, on our way to a restaurant, when we heard a CLUNK, ching ching. Paul looked at me and said, "That didn't sound good". I couldn't help myself. I started laughing. Paul started laughing too. Maybe we're too immature to be grownups, I don't know. Most people don't laugh when something falls off their car, but we've had plenty of experience driving vehicles that have seen better days. While we do the routine maintenance and upkeep, if we have extra money we tend to put it into the house or the land, not our cars. And I have to confess that this isn't even the first time some random part has fallen off one of our cars. Paul asked me to circle around through the mall to see what fell off. So I did and we drove past the area again. 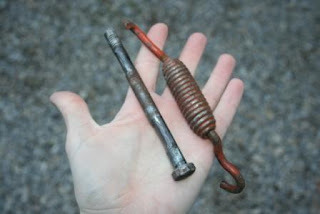 On his side, he saw a big spring, and on mine I saw a big bolt. Paul decided he needed to go pick these items up. So I circled around yet again, and pulled over to the side while Paul waited for traffic to die down. Then he made a mad dash in the cold! Across the road for the bolt, then back to our side for the spring. Paul thinks these go on the muffler, to hold it on. Has he fixed it yet? Nah. But my muffler hasn't fallen off yet either. If it does, I sure hope Paul's around to go scoop it up in traffic. Have you entered my giveaway yet? You can do so here! How fun! If it still works with missing parts, I wouldn't fix it either. Oh I so know the building a house together! Its a trial for a couple for sure! LOL We had many... um moments while we were building this house LOL. SISTER! We're currently ignoring a slightly leaky pipe in the crawlspace and a potential problem with the car. Minor details after figuring out last summer that the front bearing wall of our house was being held up by the 90-year-old clapboard siding. I am with you... it is either LAUGH or CRY sometimes, and I like to choose laugh! When my car starts making bad noises, I just turn the radio up!?!?!?! And who says it isn't normal to have your lawn mower held together with duct tape??? Lisa, I am still laughing!..this post was so funny,cause YES!, I can relate,hehe. I was thinkin'(scary), that this would be a great linky-party:There's always something that needs to be fixed! Oy!!! Thank goodness we can laugh! Too funny! I feel exactly the same way about our 111 year old house. I am happy most days for the little things-it's the big things (like the broken pipe last year that was slowly filling the basement with water) I worry about! I'm keeping my fingers crossed for your muffler! Busted pipes! Busted cars! You crack me up! But fixing it--yeah, sometimes that's another store for us. Sometimes I feel like life is just a great big DIY project! You are doing well if you only have a list of 20 things to do! One at a time, or one a year, the ones that need to get done, get done. The rest can wait. OH I so know what you mean about the Farm Life and fixin'....never ending saga...and often drama! Glad you guys can laugh about it! So much better to laugh about it then to cry about it! Oh & you SERIOUSLY have to post about the no water for 3 months. OOOOHHH my gosh that is just crazy! We did no hot water for 8 days & I just about died. Please tell me this was prior to your boys. Ohhh man that would be soooo hard if it wasn't!